Kakato® Premium Pet Food has recently revamped the packaging label of all 23 flavours of tinned food and newly labeled products are now being gradually introduced into the market. This aids to enable easy reading of more detailed information of the product contents, please be assured that all existing flavours, ingredients and formula remain unchanged. New label shows more detailed Guaranteed Analysis to replace the Typical Analysis. New label depicts seals highlighting the product’s special feature for easy reference. New label shows content food in colours and brightness much closer to actual. 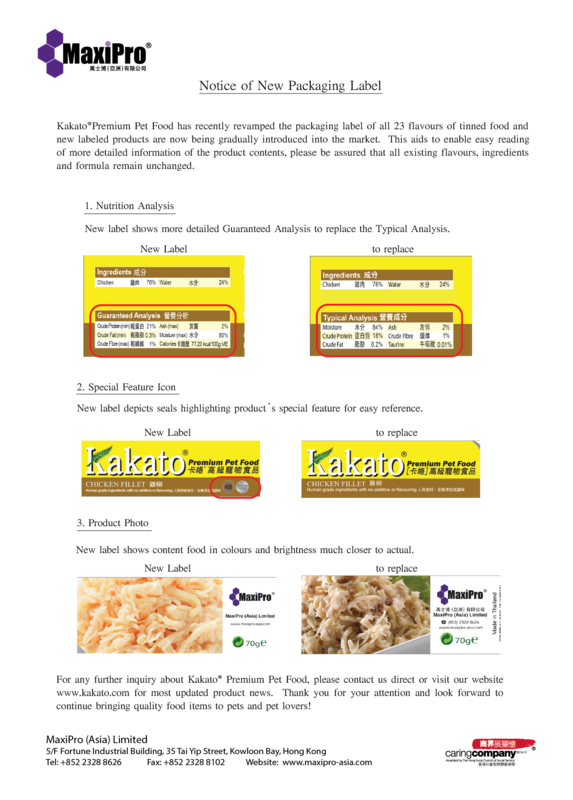 For any further inquiry about Kakato® Premium Pet Food, please contact us directly or visit our website www.kakato.com for most updated product news. Thank you for your attention and we look forward to continuing bringing quality food items to pets and pet lovers!